My name is Bethany and I am a proud peer educator for a grade 4/5 class at Rideau Public School! Afterour first lesson we decided the students would benefit from splitting up the grades in order to satisfytheir grade requirements more effectively. This smaller student-to-teacher ratio has made the lessonsso valuable because we get to know each of the children we teach. 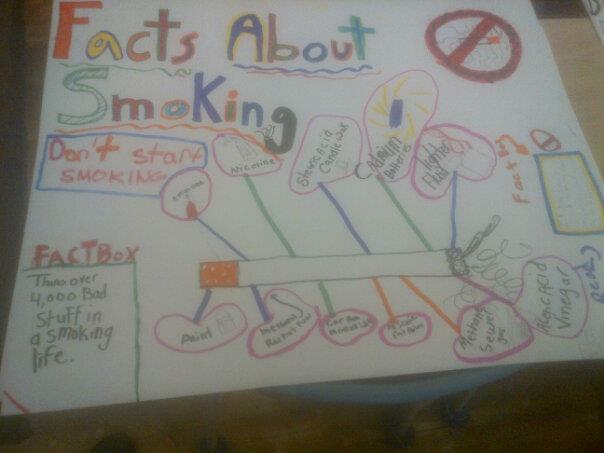 I am teaching the grade 4s andwe have been working hard to learn all the harmful effects of smoking. Last week we discussed howsmoking companies persuade youth to buy cigarettes. By examining numerous smoking advertisements we concluded no matter what they say, SMOKING IS NOT COOL! The students are so eager to show how much they know about smoking that they worked in groups to produce wonderful anti-smoking posters. These posters will be completed this week and will be posted up in the hallways of Rideau Elementary School. This week we will be practising how to say NO, with different role playing activities. This class isfull of leaders, and are excited to teach others about everything they know about leading a healthy life. One student promised to not include any scenes of smoking in his future movie producing career, haha! While another promised to discourage his little siblings from smoking. I look forward to spending time with this vibrant class every week and can’t wait to see how they respond to the next lessons with me!! My name is Emily and I am a Peer Educator with Bethany in a grade 4/5 class at Rideau Public School. I just joined the project about a month ago and I'm so happy to already have the opportunity to meet students. Currently, I have been teaching the small group of grade 5's in the the class about alcohol. It's been really great to get to know all of the kids well. Last week we talked about the effects of alcohol on the body. The kids got to experience how alcohol can make people lose control of their actions by wearing some homemade "drunk goggles" and trying to do some normally easy tasks while they were dizzy or had impaired vision. We also played a matching game where the students categorized the effects of alcohol into "long term", "short term" or "both" and talked about what all of the effects meant. This week, we learned about why some people choose to drink, and how we can safely and assertively decline alcohol if someone is offering it to us. The students acted out different scenarios where they were being pressured to drink alcohol but successfully declined. These lessons were the first introduction the students had to this topic and they were really involved in learning about it and were really keen to show the different ways they could turn down drinking. Next week we're bringing the grades back together to start their introduction to puberty; stay tuned for updates ! !